One of the major insights gained during our most recent trip is that we have stored gear, from sewer hoses to coffee makers, like we did in our 2006 View J. For those familiar with these Winnebago floor plans, our 1015 Navion V is laid out completely different. Our first task was to develop a set of criteria to help us arrange things in a more efficient way. Our previous storage criteria was to 1) match the storage space with the shape of the gear and ignore convenience and 2) keep the weight down. We now have a lot more cargo carrying capacity (CCC) and more space. Now we have more gear and less patience with getting on our knees to retrieve that gear. We first measured various openings and then set out to The Container Store at Southcenter. 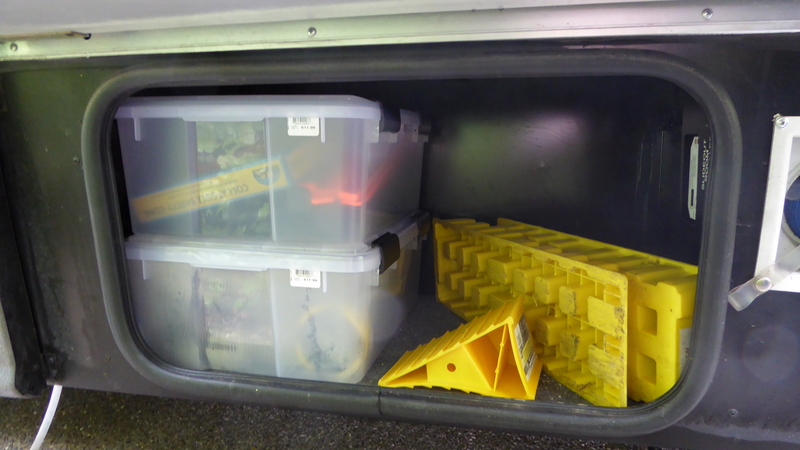 The staff was incredibly helpful and their Clear Weathertight Totes are exactly what we needed. They come in different sizes, we bought eight that will fit through the openings of all the exterior doors. The Navion has an exterior compartment on the rear right side that has a seal and is apparently for wet items. 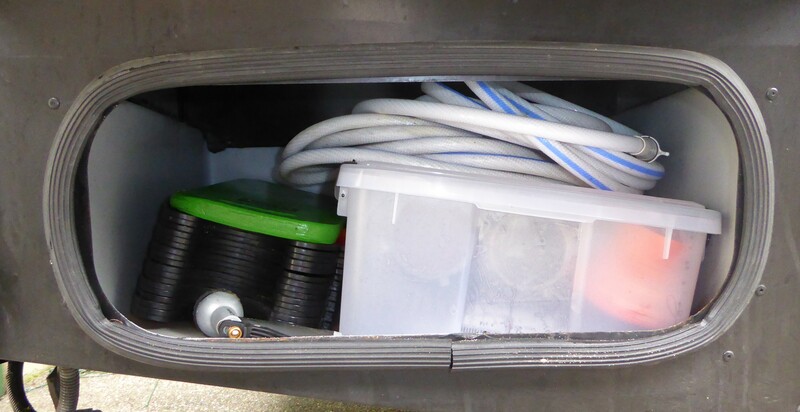 I had stored the sewer hose and connections in here in a treated canvas bag, but the zipper broke and things were just not “tidy” enough. 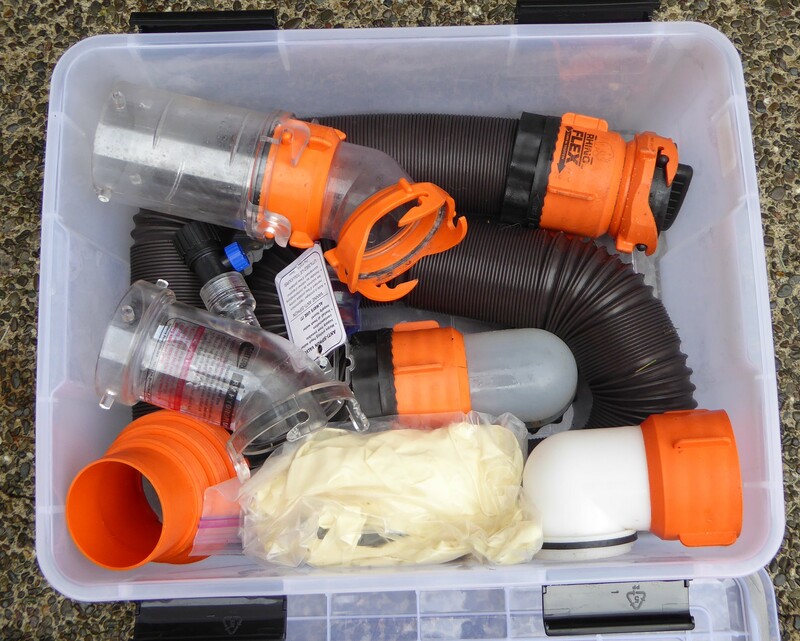 The new arrangement has all the sewer items in one box, along with the hose support, knee pad, and two 25′ water hoses water hoses. The water hoses are connected end to end, so no contamination. Everything gets rinsed when used and the seal on the container keeps any smell inside. I broke the hose support into two sections so it would fit. This also helps with the issue of the sewer outlet not being very high off the ground. The exterior compartment under the slide requires extreme yoga to access when the slide is out, so here is where we store little-used gear. These boxes contain an extra sewer kit (we’ve been camping where twenty feet was not long enough), emergency triangle and cone, and a heavy gauge 110V extension cord. A coffee aficionados, we needed a taller and convenient place for the coffee makers. Under the kitchen sink is ideal for us. The Black & Decker machine is used in the mornings when we leave as we can make a pot of half-caf in the thermal carafe that lasts until lunch. 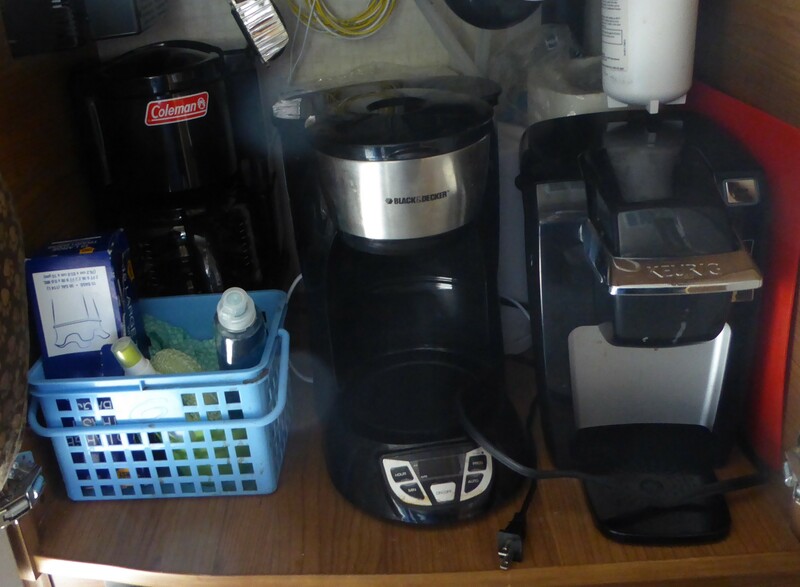 On the left is our drip coffee maker for boondocking (using the stove) and the pod machine is used when we stay more than one night as we have slightly different tastes in the boldness of the roast. Mark us down as addicts. More on the interior next time. Comments and pictures about what you’ve done are most welcome! This entry was posted in RV, Travel and tagged ITASCA, NAVION, RV STORAGE, THE CONTAINER STORE, WINNEBAGO by Landon Kimbrough. Bookmark the permalink. like your ideas and look forward to the next installment- i also have a V and not sure where to put thing!